OP0580. 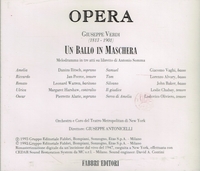 UN BALLO IN MASCHERA, Live Performance, 22 Nov., 1947, w.Antonicelli Cond. Daniza Ilitsch, Jan Peerce, Leonard Warren, Margaret Harshaw, Pierrette Alarie, etc. (Italy) 2-Fabbri Editori 13. Long out-of-print, final copy! "Daniza Ilitsch was born in Belgrade and studied at the Conservatory of her hometown and later in Berlin . In the role of Nedda in Pagliacci, she made her debut in 1936 at the Berlin State Opera and appeared in guest performances at various stages, among them the Vienna State Opera (1938 and 1939), where she became a member of the ensemble in the last season during the War in 1943/44. Vienna remained the central point of her career during the first postwar years and she appeared at the Volksoper and at the Theater an der Wien, where opera was given then. Soon after the War, Ilitsch was approached by the Met, where she made her debut on 12 March, 1947 as Desdemona in Otello. During her two seasons at the MET, 1946/47 and 1947/48 she was heard as Leonora in Il Trovatore, Amelia, Aida, Madama Butterfly and Gioconda. Her career was cut short by a dangerous illness, which forced her into premature retirement. She returned to Vienna, where she lived totally secluded and where she died on 17 January, 1965 at the age of only 51." "Leonard Warren emerged as the principal baritone of the Met’s Italian wing in the early 1940s and remained so until his untimely death on the Met’s stage, 4 March, 1960, at the peak of his career. His smooth, velvety, and beautiful voice was powerful and had an unusually large range in its high register. It was easily and evenly produced, whether he sang softly or roared like a lion….Warren acted his roles primarily by vocal coloring, expressivity, and his excellent diction….his singing was unusually consistent….Warren’s legacy should be of interest to all lovers of great singing." "[Warren's] remarkable voice had a dramatic intensity which did not come naturally to him. As with everything else in his life, he worked at that until he got it right. Fortunately, his incomparable voice and dramatic power are still available to us on recordings of some of his most famous roles....[He] became one of the most famous and beloved operatic baritones in the world....Warren's flawless technique, seamless flow of sound, and brilliant top voice were his vocal trademarks and these qualities became the standard by which others would be measured, including me." “Margaret Harshaw, an American soprano and mezzo-soprano who was best known as a Wagnerian singer but whose performances in Mozart and Verdi operas were also highly regarded, sang at the Metropolitan Opera for 22 seasons, from November 1942, when she made her debut as the Second Norn in DIE GOTTERDAMMERUNG until March 1964, when she gave her final performance as Ortud in LOHENGRIN. Because she spent the first nine years of her Met career as a mezzo-soprano and then switched to soprano roles, she sang more Wagner roles than any other singer in the Met's history. These include 14 roles in the RING operas, in which she began as a Rhinemaiden and eventually sang all three Brunnhildes, as well as both Senta and Mary (in the same season) in DIE FLIEGENDE HOLLANDER, Isolde in TRISTAN UND ISOLDE, Magdalene in DIE MEISTERSINGER, Kundry in PARSIFAL and Elisabeth and Venus in TANNHAUSER. A series of competition victories in the early 1930s led to performances in Philadelphia, Washington and New York, all before she enrolled at the Juilliard Graduate School to begin her formal studies with Anna Schoen-Rene in 1936. In March 1942, Miss Harshaw won the Metropolitan Opera's Auditions of the Air, and she began her career at the house at the start of the next season. In 1950 Rudolf Bing, the Met's general manager, was looking for a dramatic soprano to succeed Helen Traubel, particularly in Wagner roles, and persuaded Ms. Harshaw to switch to the higher range. She did so with notable success: her recordings as a soprano show her to have a clear timbre and considerable power. All told, she sang 375 performances of 39 roles in 25 works at the house and was heard in 40 of the Met's weekly live broadcasts. Ms. Harshaw also sang at Covent Garden, Glyndebourne, the San Francisco Opera, the Paris Opera and with companies in Philadelphia, Cincinnati, New Orleans, San Antonio, Pittsburgh and Houston. She also made several Latin American tours and was a soloist with many of the major American orchestras.